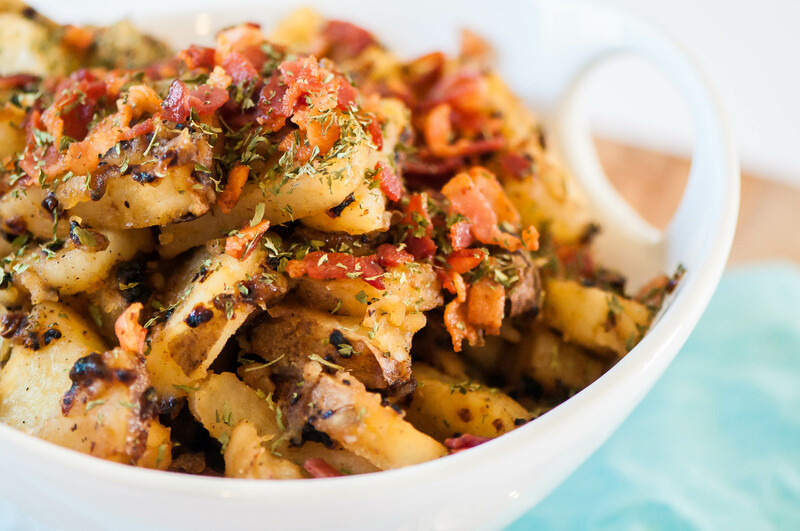 Sweet, vinegary sauce tossed with potatoes, caramelized onions and crisp bacon makes for this Caramelized Onion German Potato Salad the best way to celebrate the end of summer and welcome fall this Labor Day. I have to admit that we are not a big potato salad family. If there is a choice between potato or pasta salad we always, always choose pasta salad. Don’t get me wrong, I love potatoes in all forms but there’s just something about the potatoes, mayo, celery, onion thing that I just don’t dig. Well, I don’t like raw onion and don’t have strong feelings towards celery either so that’s probably part of the problem. It just ends up a mushy mess with random, gross crunchy things. Bleh. This is a real good start to a potato salad post, huh? Don’t worry. The one exception for me is German potato salad. The vinegar sauce is definitely the selling point for me. Oh and the bacon. Bacon helps any situation. I also like that the onions are cooked and the dish is served hot or warm. Since it doesn’t contain mayo it’s better for parties where the food will be sitting out for awhile. With Labor Day fast approaching, marking the end of summer, this is a fun salad that still has summer qualities but is warm and hearty for the cooler weather to come. I took a traditional German Potato Salad and cranked up the volume by caramelizing the onions. You guys are probably all like “enough with the caramelizing of the onions Meg, we get it.” But seriously, they put this potato salad over the edge. They add another slight element of sweet and richness without being overpowering. And we all know bacon and caramelized onions were made for each other. That’s just a fact. To make this tasty little dish, we first start by boiling 2 pounds of whole, unpeeled russet potatoes. While those guys are boiling, caramelize the onions. I diced the onions finely so I didn’t receive any complaints from the complaint department, aka husband and son, so they caramelize quickly. And while they are browning and getting sweet, quickly whisk up the sauce in a small bowl and crisp up the bacon. Once the potatoes are cooked through, slice them into rounds then half-moons and maybe be patient and wait until they cool a bit. Or, you know, burn your fingers because you have to get this recipe done and photographed before preschool pickup. Oh wait, that’s just me. Whisk the sauce in with the onions and cook until it thickens just a bit then toss with the potatoes. Top with all that crispy, delicious bacon and some parsley. I love the textures and flavors in this Cararmelized Onion German Potato salad. There is soft from the potatoes and crunch from the bacon. Sweet from the sugar and onions, sour from the vinegar and the bacon brings the smoky saltiness. You can serve it straight from the pan, which is my favorite way, or at room temperature. It’s great served alongside grilled brats to keep it German and summery. I’m making it next week for Labor Day. What are you guys grilling and whipping up next week? Place the potatoes in a large stockpot and cover with water 2 inches past the top of the potatoes. Bring water to a boil and boil for 15-20 minutes or until tender when poked with a knife. Drain and slice into quarter inch rounds then in half. Meanwhile, dice the bacon in small pieces and cook over medium heat until crisp. Remove from skillet and drain on a paper towel. Remove all but 1/4 cup bacon grease from the pan. Add the onion to the skillet and cook for 15 minutes, stirring often, until softened and brown. Whisk in the vinegar, sugar, Dijon mustard and salt. Stir until thickened and bubbling. Gently toss in the potatoes until they are fully coated. Top with bacon and serve. Wow, this potato salad looks crazy delicious! This looks like a great dish to transition from summer to fall, with the comforting flavors of caramelized onions and bacon. Delicious!